The first incarnation of the Yoga Birds Kirtan Choir just happened at the studio! A huge thanks to all who participated. It was a sincere endeavor into the unification of breath, voice, tone, vibration, and mantra. We did breathing and simple movement exercises to warm up the body. We did humming and singing long tones supported by the harmonium for vocal warm ups. The highlight was singing a complete song, Ganesha Sharanam, in traditional call and response Kirtan with harmonium accompaniment. All judgements about our voices and blockages to the harmonious radiant inner Self were dissolved by breathing well and singing the words and melodies. It was so good! For me in kirtan, the real magic happens in the potent silent spaces between songs. The high vibration created by the voices and music is a tangible slice of the transformative powers of bhakti yoga. We are vibration and we are all one. We will be doing it again next Sunday. Press ‘play’ on the video above to sing Ganesha Sharanam kirtan with Jai Uttal. We have been having a great time exploring the Primary Series of Ashtanga Yoga at the studio. I found some super valuable resources, or ‘cheat sheets’ in PDF form on the internet at AshtangaYoga.Info. The sheets have the opening and closing invocations, all of the poses of the Surya Namaskars, Primary Series poses, 2nd Series poses, and finishing poses. I copied them front/back and then laminated the sheet. It’s the perfect companion to my practice. This has been a year of new and exciting exploration into other styles and practices of yoga. 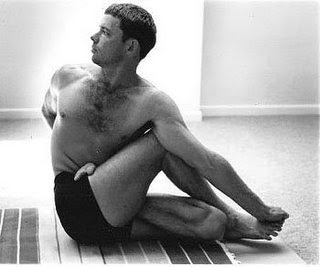 The consistent Ashtanga practice is still going strong, making me stronger. It’s real gifts are in the subtle domain. I feel more in control of maintaining focus off the mat. This is good because I am hyper distracted otherwise. What freedom! As I contemplate the end of the calendar year and start thinking about 2013 I feel great transformation on the horizon. There is so much challenge and suffering in everyone’s life, yet beauty and goodness always seem to save the day. This life is so much more manageable ‘one day at a time’. And when each day includes a few moments of pause and inner connection life’s preciousness is even more readily evident. 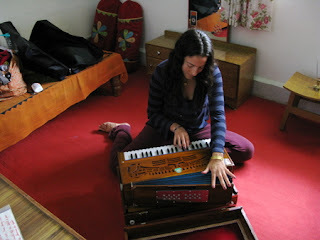 After a weekend of singing in kirtan with my friends in Prema Hara, I am all the more pumped about bringing the harmonium and singing into my yoga classes. At Christ The King, Sr. Immaculata used to say to us “Singing is praying twice.” I could not agree with her more. This Sunday I am psyched to explore vocalizing breath and practicing some singing and chanting exercises from other cultures in the Vocal Yoga class at Yoga Birds. It is a three part series but drop-ins are welcome to join. Come out and sing in community. Lets make some magic in Fairhope.